Ships and aircraft with large amounts of aid have descended on regions hit by last Sunday's Indian Ocean tsunami. A US aircraft carrier arrived in Indonesia, sending helicopters to worst-hit Aceh province, as transport planes head for Sri Lanka and Thailand. But Indonesian officials say distribution networks are still not in place to get aid into remote areas. At least 124,000 people died in the tsunami. The UN says the toll is nearing 150,000 and may never be known. Thousands are still missing after a huge undersea earthquake struck off the Indonesian island of Sumatra on Sunday, sending giant waves smashing into coastlines from Malaysia to East Africa. Sweden, the Western country thought to be worst hit by the disaster, is holding a day of mourning, along with Norway and Finland. 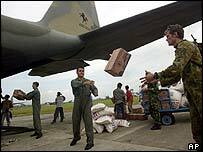 The BBC's Rachel Harvey in Aceh says heavy machinery and expertise - helicopters, medical supplies and water purification equipment - have been arriving at the provincial capital Banda Aceh with masses of food supplies. The first of 12 helicopters from the US aircraft carrier Abraham Lincoln arrived with the aim of getting help to areas cut off since the disaster struck. There are reports that survivors swarmed onto some of the aircraft in search of food. American, Australian and Singaporean military personnel are on hand to assist their Indonesian counterparts. The province's ravaged infrastructure has been a major obstacle for aid agencies, says our correspondent. The US has also supplied 80 trucks to distribute aid. But scenes at Banda Aceh's tiny airport are chaotic, owing to a shortage of manpower and storage space, says our correspondent. Officials who have so far fought with dwindling supplies are having to deal with a massive operation, she says. Indonesian President Susilo Bambang Yudhoyono, who is visiting the region, tried to speed up distribution efforts. "We have the obligation to save each and every one," he told soldiers at the airport. Until now there has been little sign of a co-ordinated relief operation for the estimated two million people who have been displaced in Aceh. Alwi Shihab, the Indonesian minister put in charge of the operation, told the BBC the government had been "in panic" for two days after the earthquake. The UN Assistant Secretary General for Humanitarian Affairs, Margareta Wahlstrom, noted the same situation on a visit to Sri Lanka, where the relief effort is being hampered by torrential rain and flash flooding. "The strong impression we have is that it's just now the last two days probably that local authorities are getting fully organised and that aid workers are working with them... because they are also under trauma, they've lost families," Ms Wahlstrom told the BBC News. "I think in the next few days we will see important changes in how the whole machinery ticks on here," she said.